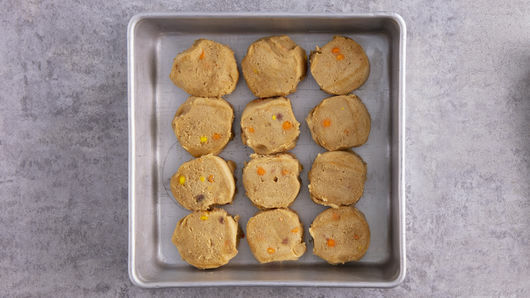 Place cookie dough rounds in bottom of ungreased 8-inch square pan. Bake 22 to 24 minutes or until edges are deep golden brown. Cool 10 minutes. 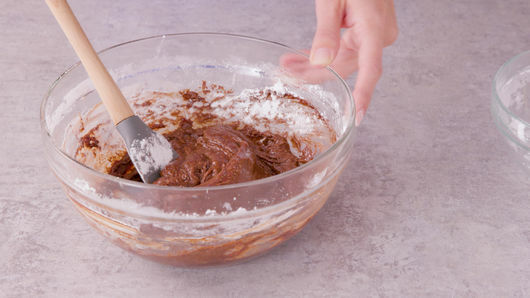 To make fudge layer, place butter in medium microwavable bowl. Microwave uncovered on High 45 to 60 seconds or until melted. Add brown sugar, cocoa and milk; stir with whisk until well blended. Microwave 1 1/2 to 2 1/2 minutes or until mixture comes to a boil, stirring every 30 seconds, until smooth. Add powdered sugar and vanilla; mix well. 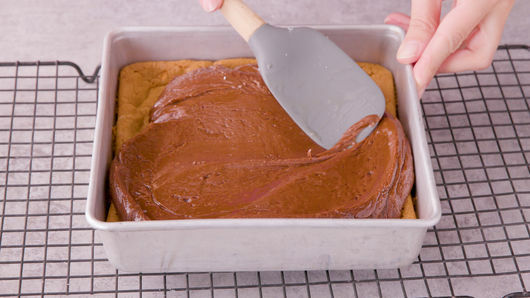 Pour fudge mixture over baked crust; spread evenly. Sprinkle with candy wedge pieces. Cool 10 minutes. Cover and refrigerate 1 to 1 1/2 hours or until set. To serve, cut into 6 rows by 4 rows. Store covered in refrigerator. When it comes to desserts, my family excels at both creating and consuming them. My mom made the flakiest pies and the moistest cakes I ever tasted, but my absolute favorite, the one that always brought me running, was Grandma's fudge. Grandma's fudge is unique in that it must crystallize into a hard consistency. The recipe includes four cups of sugar! You put unsweetened chocolate, sugar and milk into a pot, attach a candy thermometer to the side, and slowly stir the mixture over low heat until it reaches 238°F. My 11-year-old self would restlessly hop from foot to foot and sigh at the longevity of the project. When the red line of the thermometer finally reaches its peak, you remove the pot from the stove and place it on a cooling rack to add butter and vanilla. But the wait is not over! The temperature of the mixture must drop below 150°F before it can be vigorously stirred into granulation, and timing is of the essence. Stir too long and the fudge hardens in the pot. Pour it into the pan too soon and the mixture never sets, but remains a brown, sugary mire. This is the proverbial watched pot that never boils, also known as, "are we there yet?" Done correctly, when you pour the fudge into the pan it sets instantly. I would impatiently cut out a square (or two, or three) and pop the lovely treat into my mouth where it melted on my tongue. Pure bliss. As an adult, I still love Grandma's fudge, but the combination of peanut butter and chocolate has a new place in my heart. The first time I saw the Pillsbury™ Big Deluxe™ Reese’s™ mini pieces refrigerated peanut butter cookies, I imagined how exquisite they would taste with fudge layered on top. This fudge has to be more pliable, however, to perfectly blend with the cookie dough. 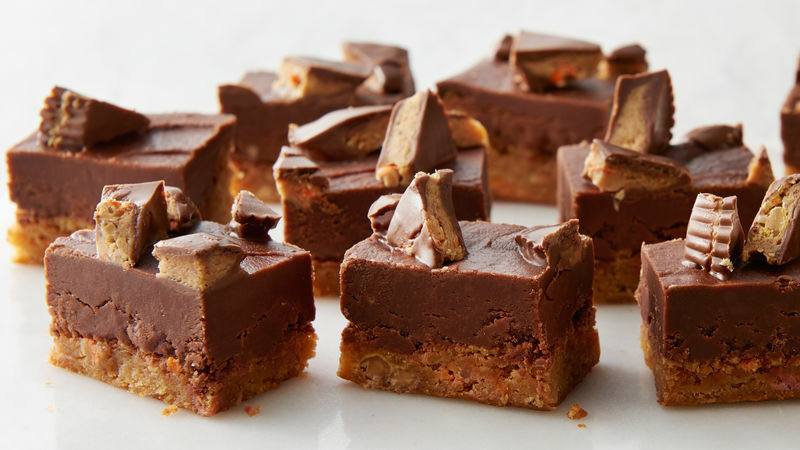 Of course, the other difference with my Reese's™ Piece O' Bliss Fudge recipe is how much easier you can go from beginning...to bliss. Grandma and Mom would be proud, and lick every crumb off their fingers.